Other than for clearance of obstructed views, much of the pruning that is performed today accomplishes little or nothing of merit to the property owner or the tree. Unfortunately, this approach wastes money by removing the wrong branches. The primary focus when pruning landscape trees should be to reduce conditions that contribute to weakness. Young trees should be pruned to guide growth so their crowns clear urban structures while ensuring they develop strong structure. Established trees in urban landscapes should be pruned primarily to reduce risk, preserve a tree structure that boosts amenity values, provide clearance, and improve the aesthetic value of the property. Achieving these objectives requires different pruning strategies for trees of different species, life stages, and sizes. In structural pruning, only the parts of the crown that contribute to weakness are pruned in order to direct future growth into one leader. 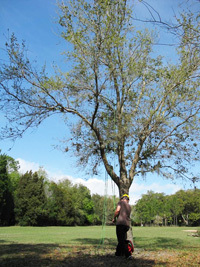 Structural pruning also slows branch growth rate of aggressive or long branches, and thins uncharacteristically dense clumps of branches high in the tree. Rather than a one-time event, structural pruning should be thought of as training process that improves tree structure over a period of time. Once structural pruning is completed, one or more other pruning methods can be applied if needed to provide clearance and aesthetics provided the targeted pruning dose has not been exceeded. 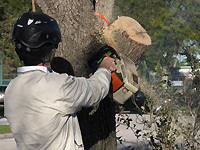 Other pruning methods on established trees, including crown cleaning (removing dead, touching, infested branches), thinning, reducing, and raising, can be applied according to desired objectives, while considering current structure, health, size, location in the landscape, species, presence of stress conditions, and other factors (see Section 7). Each of these other methods can be applied to the entire crown, or to only one portion, as appropriate. A single pruning method need not be applied uniformly to the entire tree. For example, one side of a crown can be reduced to relieve a structural weakness, and the other side can be raised for clearance or thinned to balance the crown. Additionally, arborists must consider how much foliage should be removed—the pruning dose—to accomplish the goals and maintain tree health. The longer the pruning interval, the larger the pruning dose should be on codominant and other defective branches. The pruning dose is the estimated amount of foliage or buds removed during pruning compared with the total amount on the tree prior to pruning. The ANSI A300 Part 1, Pruning Standard recommends a pruning dose of less than 25% at any one pruning treatment; however, this represents an average of trees across all ages and health. 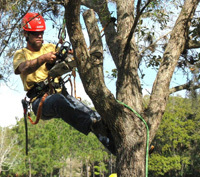 Healthier and younger trees tolerate greater amounts of live branch removal than do mature or unhealthy trees. Larger doses can be applied to certain branches or sections of the crown to improve structure or for other reasons. For example, about 60% of the foliage and buds on a medium-aged tree may be removed from a large codominant stem to subordinate it; other portions of the tree may be lightly thinned in order to mechanically balance the tree or to improve aesthetics. Pruning a branch slows growth on that branch in proportion to the pruning dose and can direct future growth by invigorating parts of the tree that were not pruned. A large pruning dose is sometimes necessary to accomplish structural pruning objectives when poor structure exists. This can cause many hardwoods to generate sprouts. With the exception of Canary Island Pine, redwood and perhaps some other species, most conifers generate few sprouts. New sprouts can emerge from latent buds and adventitious points throughout the crown, but many grow from points near pruning cuts. Sugars and other growth substances generated by sprouts help the tree resist decay behind pruning wounds. These substances also help replace the stored energy removed with the live wood, making sprouts an acceptable condition when structural pruning. The growth rate of the most vigorous sprouts can be subsequently suppressed by reducing and removing them where necessary to prevent them from interfering with other branches and with each other. Less-vigorous sprouts should be retained to help the tree slow the development of decay behind the pruning cut. Resist the temptation to remove sprouts entirely because they are an asset to a structurally pruned tree.